I took this while we were in Hobbiton. It was a beautiful day and with all of the flowers blossoming there were lots of bumblebees buzzing around and I managed to snap this just as this bee paused and looked up. This spider has taken up residence on our back veranda for the last couple of weeks. I’m usually a bit squeamish about spiders and would have tried to shoo it away by now but I’ve left it alone as it’s not hurting anyone and there have been quite a few less mosquitos and insects around since it has made itself at home. It was a lovely big moon last night and as I was photographing it, I noticed the spider was almost in my line of sight so I quickly lined it up with the moon to take a shot. It was tricky as there was a very strong wind and the web was dancing around, so catching the spider lined up against the moon was difficult, particularly as I was using a telephoto lens. This one came out quite well though and I really like it. It reminds me a little of that scene in Tim Burton’s Batman, where the Batwing appears against the moon. Maybe if he’d made a Spider-Man film instead we’d have seen something like this in it. I was in Sydney for a couple of days this past weekend and took this in Centennial Park while I was there. I’ve always loved swans; they’re such graceful creatures and I enjoy photographing them. One of my very first photographs was of a black swan in fact. It’s nice to still be able to find new ways to photograph them after all these years. The sun setting over the ocean this evening. It was very hot today and awful fires have sprung up around western Sydney and in parts of NSW, although thankfully nowhere near us at present. Hope I’m wrong but can’t help but think we’re going to be in for a horror summer if it’s already this bad two weeks into spring. Sydneysiders woke to a strange sight early this morning. A massive dust storm had swept across the state, blanketing Sydney in a plume of dust that stretched for over 600km. It turned the sky an eerie orange-red and I’ve never seen anything like it. It felt like we had been transported to Mars. The colour came from the red soil and dust of the outback, which had been whipped up and carried inland by fierce gale force winds; it’s estimated the dust plume travelled over 1500 kilometres to reach Sydney. 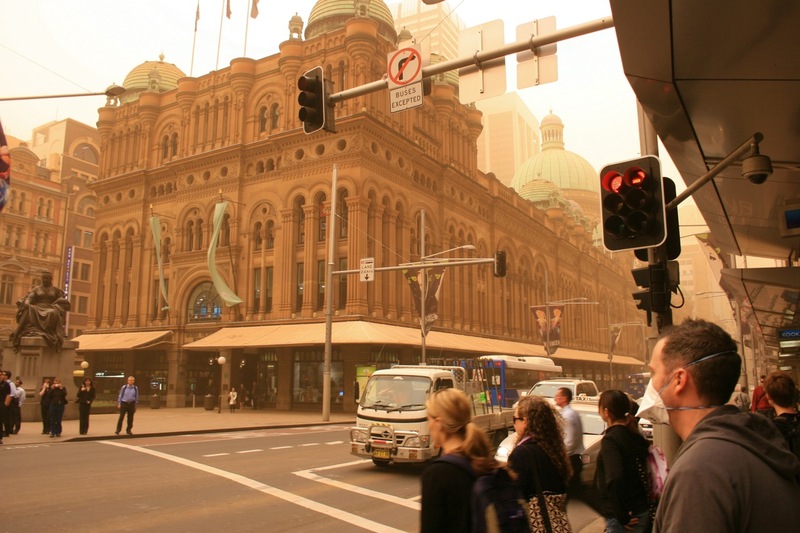 Scientists are saying it might be the worst dust storm in NSW’s history, which I can believe. The pollution in Sydney was awful all day and you couldn’t breathe easily, even after the haze had started to lift. I was still awake when the dust storm hit. It was incredible; the wind howled and the entire sky seemed to go blood-red in minutes, so much so that I couldn’t see more than 20 metres down the street. The last time I can remember anything like it was after the Black Saturday bushfires, when the sky reflected the fire and there was an overwhelming smell of ash. But even those skies didn’t compare to this; this was like stepping onto another world. With the UN climate conference beginning in New York, some green groups have suggested that it’s more evidence of global warming. I’m not so sure. Usually I’d be the first person to agree but nature doesn’t need a reason to be wonderful or terrible; I think sometimes these kind of freak occurrences just happen and we shouldn’t ascribe everything to global warming without evidence. I found it very beautiful, despite the chaos it caused. Unfortunately I didn’t think to take any photos; I didn’t realise how widespread it was at the time. But there are some incredible photos on Flickr and I thought I’d post some of them to give an idea of what it was like. There’s still a dusty smell in the air and the winds are still strong even now, 18 hours later. I doubt I’ll see anything like it again in my lifetime. Unless I go to Mars.